Imad Ibrahim, PhD Candidate at Sant’Anna School of Advanced Studies, Pisa, Italy; Research Associate at Global Law Initiative for Sustainable Development (gLAWcal), Essex, United Kingdom; EU commission Marie Curie Fellow at Tsinghua University and at Beijing Normal University (Beijing, China) and Energy policy expert at the Lebanese Oil & Gas Initiative – LOGI, Beirut Lebanon. Master in European Interdisciplinary Studies (College of Europe). 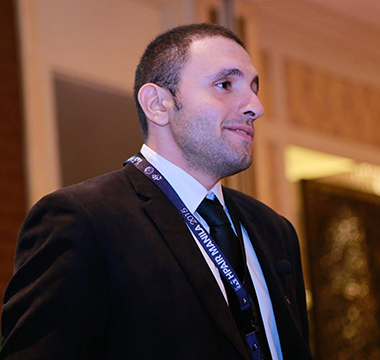 Since September 2014, Mr. Imad Antoine Ibrahim has been Research Associate and Project Manager at gLAWcal – Global Law Initiatives for Sustainable Development. Mr. Ibrahim is a Lawyer admitted to the Lebanese Bar and specialized in oil and gas law with a one year of experience in drafting oil and gas contracts and legal advices at Al Jad Law Firm. He works in a regional law firm handling legal issues concerning oil and gas in the Middle East and North Africa region particularly unstable states such as Iraq and Libya through a single desk approach. He also deals with disputes deriving before the Lebanese courts especially in the area of Intellectual Property and company law. He additionally contributes in organizing and/or participating in oil and gas conferences, seminars and trainings. Mr. Ibrahim holds a Master in European Interdisciplinary Studies from the College of Europe where his main focus was on the fields of European studies, International relations and international law. In his master thesis, he examined the issue of the Arab spring from a European and American perspective while insisting on the absence of the rule of law in those countries. He graduated from “La Filière Francophone de Droit” of the Lebanese University, Beirut with a thorough knowledge of European, French, and Lebanese Law. He had several meetings with EU officials in Brussels and Turkish officials in Istanbul stressing the importance of the role of the EU as global actor and Turkey as a regional actor in preserving the stability of their immediate neighborhood. He undertook an internship in the Lebanese parliament where he worked on projects for amending the Lebanese criminal law. He was authorized by the Lebanese ministry of justice in 2010 to supervise the municipal elections. In June 2014, Mr. Ibrahim was selected by the University Institute of European Studies (IUSE) in Turin (Italy) as Research Fellow on project “Insurance for Environmental Incidents related to the Petroleum Industry. An Analysis of the Existing Insurance Systems in Case of Environmental Pollution and a Comparison between the Prevention Principle and Compensation after Accidents”. In July 2014, he attended the Summer Institute on Climate Change and Environmental Protection - (SICCEP) and the Summer Institute on Intellectual Property Rights and China - (IP-China) held at Peking University School of Government in Beijing, coorganized by University of Turin Faculty of Law, University of Milan and gLAWcal – Global Law Initiatives for Sustainable Development. Mr. Ibrahim is trilingual and his fluency in Arabic, French and English helps him to deal easily with multi-jurisdictional issues and to assist and advise local, regional and international clients while he also has a basic knowledge of Spanish and Russian.